The Tuareg of one Libyan town are discovering there are serious consequences for the support some of them gave to Colonel Gaddafi. "Really, Mr Justin, now we are in good condition. Believe me, I am too happy to see you. My God, now I feel shy." The exuberant greetings are one of the great joys of travelling in Libya. In this case, my old friend Mohammed Ali from the southern Libyan oasis town of Ghadames was particularly effusive, having heard that I had just been released by my Tuareg kidnappers after being held captive in the desert. We had not seen each other in almost 13 years. I had wanted to travel south from Tripoli to meet old friends from a desert expedition years before. I had also wanted to look into stories I had been hearing about conflict breaking out in Ghadames between the town's mixed Arab-Berber population and the Tuareg. The two populations have lived together, sometimes uneasily, for centuries. Gaddafi's use of the Tuareg as local enforcers during the revolution had stirred up these divisions. Now that the town had risen up and expelled them, reprisals were in the air. "The Tuareg can never come back here," one Ghadamsi told me in Tripoli. "Not after what they have done in the last six months." I drove down with my friend Taher and his family, who have lived in Ghadames for generations. In the end, we never got there. Our car was forced off the road just outside the oasis by 16 Tuareg armed with Kalashnikovs. They hauled us out of the car, forced us onto the ground, tied our arms behind our backs, blindfolded us and drove us into the Sahara. The following morning, they told us we were going to be killed unless Tuareg prisoners held in the town were released by noon. While I was being questioned, they said the Ghadamsis had robbed, set fire to and bulldozed their houses, killed the sheikh of the Tuareg and slaughtered all their animals. Twenty-four hours after we were taken, Taher's wife and two-year-old son - together with an old man kidnapped two days earlier - were released with me. They kept hold of Taher. According to the local town council, our 20-something kidnappers were the remnants of the Tuareg Kataib. This was a local militia used by Gaddafi to suppress the uprising in Ghadames, which began on 20 February, three days after the revolution kicked off in Benghazi. They had taken to their task, we were told, with gusto, rounding up suspected rebels, imprisoning them and beating them severely with electrical cables. Bloodshed had been limited compared with the fighting in other Libyan towns and cities - a total of four people had been killed - but the abuse of power by a minority of the town's Tuareg had shattered relations between the two populations. Abdul Wahab, a former prisoner, showed me photos of his back, a mass of pink welts. "I'm really sorry about what's happened with the Tuareg," he said. "We were born together, we lived together and worked together. Everything's changed now." The morning after my release, Mohammed Ali took me on a walk around the abandoned Old City, an evocative labyrinth of covered walkways, illuminated by shafts of sunlight stealing down between the tightly clustered mud-brick houses. This ancient heart of the oasis - somewhere between 2,000 and 4,000 years old - was once one of the great centres of Saharan trade. African caravans groaning with precious stones, ivory, ostrich feathers, gold, silver and horses came north, together with straggling lines of trussed-up slaves. South-bound traders carried exotic luxuries from Europe - pearls from Paris, fine linens from Marseille, Venetian glass and paper. The Tuareg were an integral part of this age-old desert commerce. They ran what today would be called a protection racket, offering their services as guides and armed escorts to caravans passing through areas under their control. 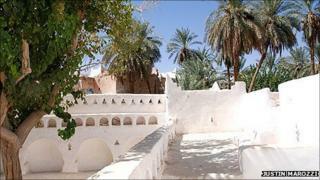 Any merchant who declined the offer ran a real risk of having his caravans plundered by Tuareg. A small part of the Ghadamsi Touareg, diehard Gaddafi loyalists, have returned to armed banditry again. The consequences of this aggression are potentially catastrophic for this small desert town of 12,000. Many Tuareg who had nothing whatsoever to do with their fellow tribesmen's brutality, intimidated by the backlash, have already fled their homes. With some reluctance, my Ghadamsi hosts showed me a part of the Tuareg quarter on Dahra Street before driving quickly away. Numerous homes lay in rubble. "They were old houses," said my friend. For years, Mohammed Ali has been the town's pre-eminent guide. Like almost everyone else, he wants visitors to return to see this jewel of the Sahara. "Really, the people of Ghadames want peace with the Tuareg," he said. "Believe me, for a very long time we have been - almost - one family."